Dunav Ultra - Official Danube cycle path in Bulgaria. A map. In general – riding a bicycle along the Bulgarian part of the Danube, whether you are a passionate Danube explorer or EuroVelo enthusiast, is an amazing experience. On the Internet you can easily find several very good maps of the region (Donau Radweg for example). Still keep in mind – the whole Danube journey in Bulgaria has its own “tricky” moments. There are some places where you can struggle to climb a hilly terrain, to find a bicycle store/repair shop or to speak with the locals (they barely speak any foreign language). Even it might not be so easy to find a trusted place that’s clean enough to stay at night . Remember – relying only on your GPS device or a map is probably not the best option when you are passing through a foreign country. That’s why since 2013 we started researching the whole area along the northern border of Bulgaria as close to the Danube River and even through the South Dobruja region to the Black Sea. Five years later we know each hotel, guest house, bike store, paved, gravel or even dirty road near Danube and we are a trusted resource for any case. 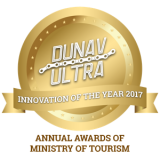 To be more complex and accurate, we divide our Dunav Ultra Cycle Route in TRANSIT and TOURIST versions. If your goal is to travel as fast and safe as you can, or you just want to reach your next stop passing Bulgaria, please use the TRANSIT version. It’s definitely the best decision for you, excluding some traffic issues, of course. You have to be very careful when you ride from Vidin to Dobri Dol (Part II), and when you cross the main road from Obretenik to Dve mogili (Part VII) – these are high traffic zones that include a lot of trucks and other vehicles. We strongly recommend to use your helmet and light reflecting jacket/vest all of the time when you ride through the High traffic zones. If you want to get the best from your cycle vacation along the Danube in Bulgaria, you definitely have to try the TOURIST version of the Dunav Ultra Cycle Route. Check our Discover section, to see some amazing photos from all over the Danube in Bulgaria. There are several parts near the Danube where you’ll be pleased to ride near the most beautiful/pristine places on the continent. For your safety and best experience, we STRONGLY recommend to use a guide for some TOURIST parts of the route. You will find our recommendations below. This tourist part is not recommended without a guide. Need a guide? Ask here!